The Bunkhouse sleeps 54 persons and consists of two dorm rooms of up to 26 or 28 people on bunk beds in a common room. Each Dorm has its own bathroom facilities. 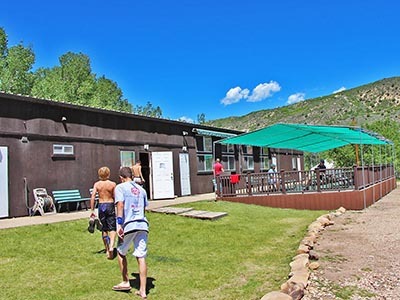 Youth groups commonly reserve the Bunkhouse (though they may stay in any of the lodges or camping area as well). Youth groups with both boys and girls must have a minimum of 35 persons to reserve the Bunkhouse, in which case the Bunkhouse is separated into a Boys Dorm and a Girls Dorm. However, single-gender groups such as Young Women or Boy Scout groups may reserve one or both sides of the Bunkhouse (depending on group size). © Copyright 2019, Reid Ranch, Salt Lake City, Utah.